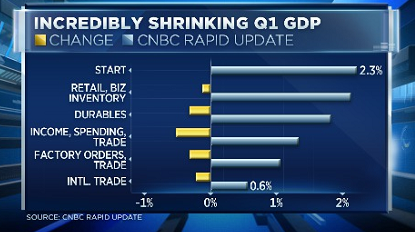 The CNBC Rapid Update shows a sharp decline in the outlook for first quarter GDP from a high of 2.3 percent to just 0.6 percent. Weakness has come from several sectors, led by trade but also including retail sales, inventories and manufacturing. Economists are puzzling over whether this is another case when seasonality in the data is depressing first quarter growth, as it apparently has the past two years, or if this is a real softening of the economy. Bulls point to strong job growth as a better indicator of the economy' strength and look for a second quarter rebound. Data this week — especially retail sales on Wednesday — should help answer the question. The first chart shows the change in the CNBC Rapid Update for first quarter since mid-February and the change from selected indicators. The second chart shows the change in individual tracking forecasts that are used to calculate Rapid Update. 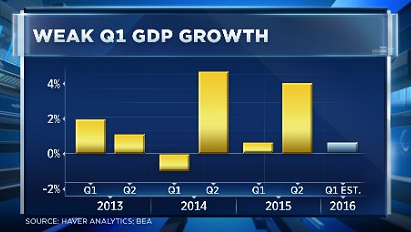 And the third chart tracks weak GDP growth.